Fly fishing adventures in both fresh and salt waters around the globe. To honor the memory of a beloved friend, fisherman, and member, the Fort Worth Fly Fishers held the Second Annual Al Crise Day on the Paluxy River in Dinosaur Valley State Park located in Al's hometown, Glen Rose, TX. Cody and I chose to attend this event because the monies raised supports two of Al's favorite charities, Casting for Recovery and Reel Recovery. 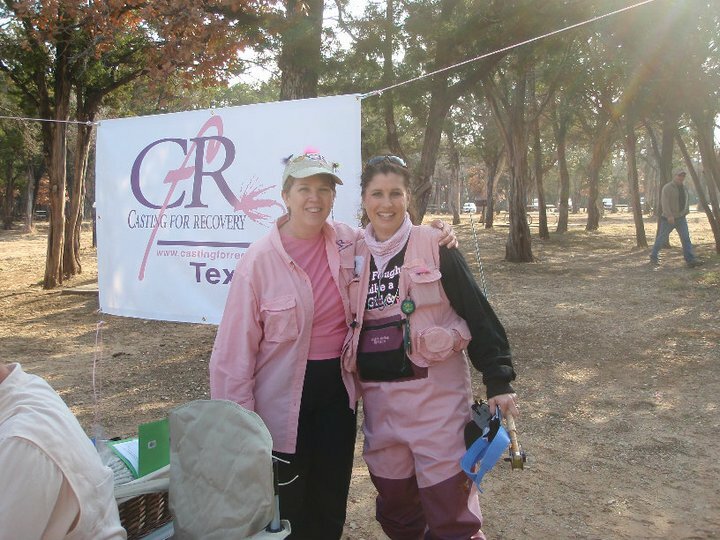 Cody and I enjoy being River Helpers for the North Texas CfR retreat for the past two years and see its positive impact on the ladies it supports (click on the link to read a wonderful thank you note from a 2010 participant). 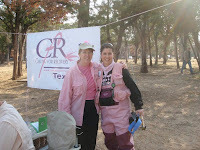 In addition to attending to support the charities, we just like to fish, and this event was a fun outing. TPWD also chose to help out and stocked 1,000 Rainbow Trout--a first for the Paluxy! Originally, after donning pink waders and greeting friends, I headed off just downstream of the Blue Hole with my 2# rod and Beadhead Prince Nymph--a huge hit with the Springfield Lake trout (i.e. Austin stocked trout) to participate in the Trout Derby. (I did forget to bring my creel, so it was going to have to be in name or photographic documentation only.) Now, there were already a dozen or so fly fishers lining the near bank and nymphing to the far side, and two fly fishers chose to move even closer to Friday's stocking point. I saw people to the left of me catch fish and people farther to the right catching fish, two being the DFF's president and vice-president, but because we packed the river like sardines, I really couldn't move to a better spot. Anyway, Cody had said 35 minutes earlier, that he was going to the car to get his gear on and bring my 4# rod with him. Having only one hit, I headed back to the car. Unbeknownst to me, I dropped my fly box of Guadalupana's--sad face when I learned it! Cody Bell was nowhere to be found, neither was his chair, his 4# rod, my 4# rod; no sign of the Boy anywhere. So I headed back down to the river and continued to walk farther downstream. As I walked along the elevated path, I noticed some beautifully deep runs that just looked fishy from the bank. I ended up almost to the second and most visible Dinosaur tracks, and there were a slew of Boy Scouts (skipping stones upstream--ugh! ), and I knew Cody Bell would be nowhere around that place. I headed back up to towards the pavilion and finally ran into my man. Cody had been hiking, and he was tired and sweaty and not dressed to fish. I listened to his tale, and the man must have hiked a mile or so around this section of river--crazy, yes! Cody unfolded his chair along the bank, drank his Dr. Pepper, and watched me fish. Asking if Cody brought the prized Cody and GirlieBuggers, Cody said he left them in the car and was off to retrieve them. I thought I was nicking the bottom or rocks and accruing moss on my hook; instead, they were timid hits from a shy trout. About the fourth retrieve, the trout emboldenedly inhaled my fly--an amber Bonefish Bitter! I couldn't believe it. I had his head out of the water and fiddled with my stupid net (I will be buying a new one--ASAP! ), and I decided to have compassion on the fellow, so I allowed his head to dip just below the water surface. Still messing around with my net, I raised the ol' boy's head out again and brought him up to get a better look. The trout amazed me with how pale he was colored, looking nothing like the two-week old stocker trout at Springfield, nor its counterparts existing in the wild; its scales were very shiny, though. In frustration to unclasp that net from the back of my vest, I dipped my rod tip well into the water and needing the net became a moot point! Cody returned, tossed his fly canister to me, and I tied on a very pretty CodyBugger with red lips. I cast four casts, and it was FishOn! Yeah, I was finally catching fish. They wised up pretty quickly, and it was a change of the fly, again, but, oh no, I had lost my fly box holding my Guadalupana's (a Lefty Ray Chapa pattern I learned at this year's Houston Fly Tying Festival). Cody decided he couldn't stand it any longer and walked downstream about 50 feet. Tying on a CodyBugger too, he fished it from bank to bank. Standing about 15 feet above the river, casting maybe 20 feet out into the river, and fishing for all of five minutes at the most, Cody had FishOn! himself, a nice Rainbow Trout! Of course, I snapped his photo. I tied on another fly, a shortstrike Black SMP, and it's FishOn! for me too. These crazy little Rainbows were hungry! Cody fished just a little while longer, because the footbridge traffic 50 yards downstream was too voluminous and too boisterous, so Cody headed back to the pavilion for bar-b-que! Of course, I stayed to fish. Feeling pretty sure my spot was played out and needing something other than a 10 ft incline to climb so I could leave the river, I moved upstream to another deep run. Getting tired, I chose to cast across the bank, and seeing that the black SMP wasn't working, I tied the Bonefish Bitter back on my line. Fine decision since it imitates a crawfish, as best as I can tell. A Bluegill liked it, too and paused long enough for me to snap his photo. Two casts later and near the same spot, I had a BassOn! His size merited the net, oh the curséd net! As I attempted to unclasp the net, the bass wriggled himself off my hook. In frustration, I slapped at the water with my pole, which was enough movement to entice that same bass to bite my fly again! I failed not in landing him this time, and boy was I glad I did. I caught a Spotted Bass, a new species for me--wahoo; it is #40 on my species list! Now, it was time to call it a day, so I left others on the river to head for bar-b-que. Cody and I met up on the path, and I had fished past dinner. I changed clothes, talked with friends, enjoyed the raffles, and tried to snap some photos, but my camera battery is way past needing a charge--it is d-e-a-d! Someone found and turned in my fly box, so I was able to get it back. We vowed to see friends on the water, at rod-building, or at the next meeting, and off for home we went. When I think back on the day, the camaraderie, the laughter, the fun, and the fish, I know Al was once again with his fly fishing club. © 2009-2018 Photos by Cody Bell and flyfshrgrl. Content is the intellectual property of Photos by Cody Bell and flyfshrgrl. No part of this blog may be reproduced, stored in or introduced into a retrieval system, or transmitted in any form or by any means, or for any purpose without the express written permission of the authors. "We prefer to make our own..."